The Supreme Court on Thursday indicted Minister of State for Interior Tallal Chaudhary for contempt of court. 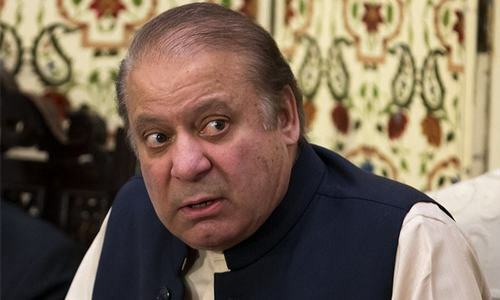 A three-judge SC bench, comprising Justice Ejaz Afzal Khan, Justice Maqbool Baqar and Justice Faisal Arab, had taken up the matter following the minister’s alleged derogatory and contemptuous statements and speeches against the apex court at PML-N public gatherings. The court provided Chaudhary's lawyer a copy of the charge sheet, which mentioned that the indictment comes on speeches made on September 24 and 27, 2017. The defendant, however, denied the charges. Earlier in today's hearing, Chaudhary submitted an application in court asking that the same restraint be shown in his case as shown in cases pertaining to Minister for Railways Saad Rafique and former prime minister Nawaz Sharif's alleged contemptuous speeches. The SC on Wednesday had dismissed a contempt of court petition against Sharif and Rafique filed by a leader of former chief justice Iftikhar Chaudhry's political party. The court had said that "commenting cleanly on a [court] decision is the right of every citizen". Prior to the charges being framed, Chaudhary's lawyer tried to sway the court into pausing the proceedings by asking that the indictment be delayed until the detailed judgment in the Sharif contempt of court case — which was dismissed — comes out. "An indictment is an unpleasant stain," the lawyer said, adding that his client's statement cannot be termed as contemptuous. "At most, the remarks can be called dishonest, but they do not fall under contempt of court." 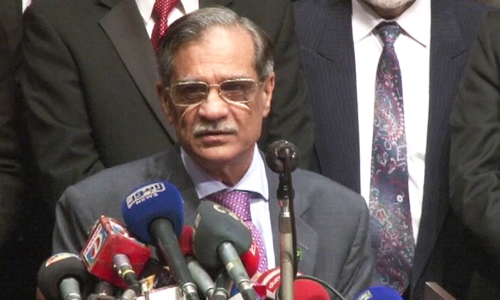 "There have been instances in the past where a contempt case was dismissed after an indictment. We will give you the chance to defend Chaudhary, let us indict him," Justice Ijaz Afzal responded. The case will now be heard on March 27. During his speech at PML-N's rally in Jarranwala in January, Chaudhary had said: "There was an era when the Kaabah was full of idols. Today, the judiciary, which is the country's highest institution, is also full of PCO [Provisional Constitution Order] idols." "Mian Nawaz Sharif, throw them out, throw him out of the court. They will not give justice but will continue their injustices." The court on Tuesday had indicted another PML-N leader, Minister for Privatisation Daniyal Aziz, over his allegedly contemptuous statements, observing that Aziz was "committed to scandalising the court". Following last year's Panama Papers judgement in which Nawaz Sharif was disqualified, members of the ruling party, including Aziz and Chaudhary — on a number of occasions — had launched unprecedented verbal attacks on the country’s judiciary, accusing it of having different standards for the former prime minister than for his opponents. Good job SC. Give him one year of jail. 6 months jail and 10 years disqaulication with the condition attached that if he ever repeated the same contempt again then he will be disqualified for good. Although I supported Supreme court over their brave Panama decision, this selective contempt of court indictments are just a mockery. Nawaz Sharif and Maryam Nawaz are daily saying far worse things against Judiciary and SC judges, and nothing is done against them, just because they are at the top while passing comments by their loyal ministers are being held accountable by SC. The vitriolic statements against SC being said by Nawaz Sharif and Maryam are not just mere contempt against courts, they are also very powerful and full of impact as they are serving as the catalyst to change people's opinion about judiciary and are making them agitated against SC judges and the whole justice system. The fact that SC is just focusing on passing statements given by loyal ministers (who no one really care) is just portraying the fact that judiciary is weak to indict powerful person. Must go behind the bar for at least one year. He should not be allowed to escape scot free. I think the general public have misunderstood the dismissal of petitions against Saad Rafiq and NS. SC court had to give verdict on the basis of the evidence submitted with petitions which was not sufficient. He should be PUNISHED for not holding any Position in any FUTURE Government of any Political Party. Should be BLACK LISTED. and a Complete Investigation of his WEALTH accumulation be carried out. Please disqualify him and people like him (Danyal Aziz, Saad Rafique, Nihal Hashmi, Maryam Aurengzeb etc.) forever, so Pakistan can get some decent leaders..
SC needs to shut up these big mouth cronies who cross all limits of decency to please their political master and benefactors. @Suhail Kidwai I will make it 5 years. Make an example out of these overpaid spoiled brats. Put these guys behind bars who have no respect for judiciary. @Khurram Doing nothing against nawaz and marium for the poison they are spreading against judiciary, will make them hero. The time is not far when people will start believing them. Good decision, but why both Tallal Chaudary and Denal Aziz are not punished and sent to jail for their conptemt of court speeches. This is what public want to know without further delay - court cases are taking far too long to reach to it's conclusions. Please speed up and send all culprits behind bars without any mercy, as they deserve! Proven culprits should be sent behind the bars for a specified period and fined as per the law. Lock him up!!! he deserves this..
these noon leaguers think the law does not apply to them, a hint of their contempt for democracy. The venom coming out of the mouth of PML-N politicians needs to be curbed! What a pity they came into power via democracy and yet they remain clueless about rule of law and respect for Judicial institutions! Jail should be their place not parliament! Talal insulted judges and judiciary openly in public rallies more than once. He must be put behind bars for at least one year. Maryam Nawaz and his father should be the next. Notice the Minister of Informatiom is always there to support her party members or as Maryaam Nawaz's Pion - no matter how vile - instead of doing her Job she was apppointed for. He invited judges to take action against his outrageous behaviour. Excellent decision by the Supreme Court of the Islamic Republic of Pakistan. Contempt of Court is a totally different concept under English Common Law in Great Britain and America. This man has been abusive and even threatening not just once by mistake but he seems to be getting bolder and more aggressive in displaying his contempt for the law and justice, the judiciary and the honourable judges. Considering his latest statement in one of the talk shows yesterday, he has become a threat to the safety and security of the judges and their families. He has publicly indicated that the judges can easily be targets of shoes attacks by the goons he heads in Nawaz-League. No leniency, he must be punished for his crimes of contempt of court as well as obstructing justice. @Khurram Yes but Nawaz is already disqualified and Maryam holds no government position. But I do thin SC should put a ban on their speaches and rallys. He should pay the price for his deplorable behavior. Put him in jail for life! How dare they criticize the sacred Judiciary which supported all military and undemocratic takeovers of powers in Pakistan. Falcon1 " Notice the Minister of Informatiom is always there to support her party members or as Maryaam Nawaz's Pion - no matter how vile - instead of doing her Job she was apppointed for." How true. Goes hand in hand with many people being found wandering in hospitals as opposed to where their job and duties put them! @Mirza - "What is the punishment?" Have some patience. All will be revealed. I think supreme court is waiting to see the results of cases against the Shariff family in the accountability court where the punishment which can be awarded is far greater than in contempt of court cases. Sad Rafiq is also likely to be charged by NAB in Ashiana housing scheme where punishment as well as financial penalty is far higher. So why punish for contempt where the punishment is minor particularly for Nawaz who has already been disqualified for life. No leniency for those who scandalize the judiciary. My suggestion to the SC - enforce the norm that any sub-juice matter will not be discussed publicly. Put a stop on the press conferences these people hold as soon as they come out of the court. Lower courts are full of pending cases, even in SC a lot of public cases are pending yet cjp is busy with political cases. Please get your house in order first. You should be seen as the most fair guy of all, currently everything looks biased. Look at Talal's face, is he worried or what? As long as they get from judiciary what they want than its fine otherwise they have the right to insult and ridicule the courts? They are unable to distinguished between their opponents politicians and judges. All who are involved in castigating or critcising Apex court for satisfaction of their self motivated interest deserve a lesson. Make an example of him and throw him in jail or ask him to step down. Why Tallal Chaudhary acts so naive that he does not know what he sort of words he is using and how he is using them in constructing sentences ...... If he is so simple and straight, how is discharging duty as "Minister of State for Interior". It is utmost important to resolve the political corruption cases. Just imagine when the top is corrupted what would be the situation in the succeeding levels of the government. It is quite challenging to prove white collar crimes, because the white collar criminals have education and understanding of political, financial, and legal systems; and, above all have effective networking locally and internationally and hire the best brains for their black money. He and others must pay the price of mocking the state law and threatening the Institution of courts. They must be made to understand the importance of living in a law abiding society. I hope PML-N at large will realize the gravity of these matters and make changes to get out of the influence of being a subject of one family and start doing things for the good of Pakistan as a whole and also bring forward people who uphold the law of state of Pakistan. This is the Worst government ever in history of democracy followed by last government of PPP. Please make an example of these selfish politicians. Just put all these corrupt politicians in jail now is the time before its too late.